I popped into Joann’s to look for a specific Happy Planner sticker book, and they didn’t have it. So of course, I browsed around the rest of the store and came out with this stack… I pulled a few papers to use for Week in the Life this year (happening in late April for my family). I wanted to coordinate with some fun colors and patterns and all of these ones really called to me. Beyond that I grabbed a alphabet stamp set on the cheap and a cute die cut pack. Couldn’t resist putting in an order from Charlotte’s Paper Co. for this pretty spring pieces. I’m especially digging the Nose in a Book Mini Kit, cause you know, books! I also received my order from Nerd’s the Word. I just had to take advantage of the flash sale last week and grab some monthly kits (love these) and a mini kit. I got another great order from Fabulously Planned. I love her kits a lot and took advantage of a great sale a few weeks back. That March monthly kit is a dream! Another great order from Stamping’ Up! 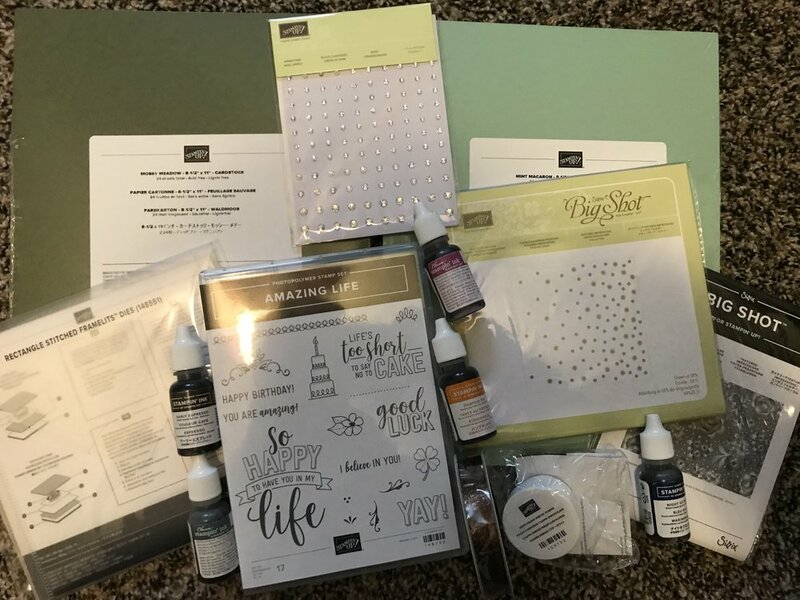 This time, I grabbed a whole bunch of items to make card kits for a friend’s retreat. The new Occasions Catalog is live! And it has so many great goodies within its pages. Today I’m sharing my Top Ten products from the catalog and my Top Three Sale-a-Bration items! 1) Coastal Cabana/Granny Apple Green 3/8" Reversible Ribbon (148572 $7.00) — This two-tone ribbon is just amazing! And so silky! I’ve already used almost half the roll. 3) Happiness Blooms 12" X 12" Designer Series Paper (148795 $11.00) — I look at the patterns and colors in this paper pack and they just make me happy. Guess it’s a perfectly named DSP pack! 4) Happiness Blooms Enamel Dots (148805 $7.00) — Coordinating with the Happiness Blooms DSP pack, SU has given us another fun set of enamel dots. I love these little embellishments to elevate a card from okay to amazing! 5) Lace Dynamic Textured Impressions Embossing Folder (148530 $10.00) — Embossing folders can be deceiving. In the catalogs they often don’t look like much, but once you use them on a card, you’ll want them all! This one has such a fun and unique pattern. I had to have it! 7) Needlepoint Nook 12" X 12" Designer Series Paper (148807 $11.00) — This is the other patterned paper pack that makes my heart sing. I love the florals! I love the colors! I can’t wait to use this on some great cards. 8) Piece of Cake Photopolymer Bundle (150579 $31.50) — Bundles are a great way to get coordinating products and save a bit of money! This bundle is the perfect size and price point. I will definitely be making some cute birthday cards out of this one! 9) Gingham Gala Adhesive Backed Sequins (148561 $7.50) — More shiny!!! I love easy embellishments and these are perfect for that extra something on your cards. 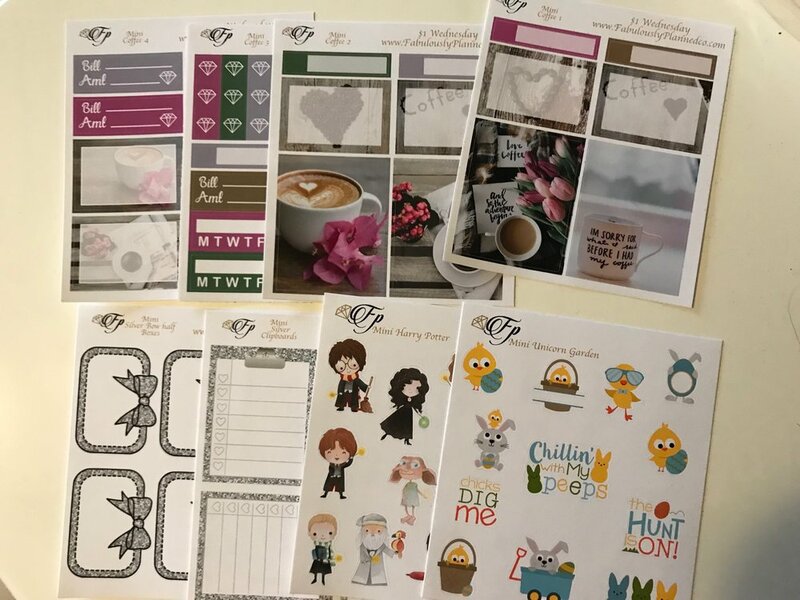 10) Amazing Life Photopolymer Bundle (150624 $50.25) — This stamp set it very cute! I can imagine a lot of fun cards coming from this. But this bundle really shines with the Rectangle Stitched Framelits! I love my Stitched Shapes Framelits, but was always a little sad that it didn’t come with rectangles. SU heard our cry and created an entire collection of rectangles! Remember: to get these amazing products, you need to place an order of $50 (for Level 1) or $100 (for Level2) in product to earn a free item! 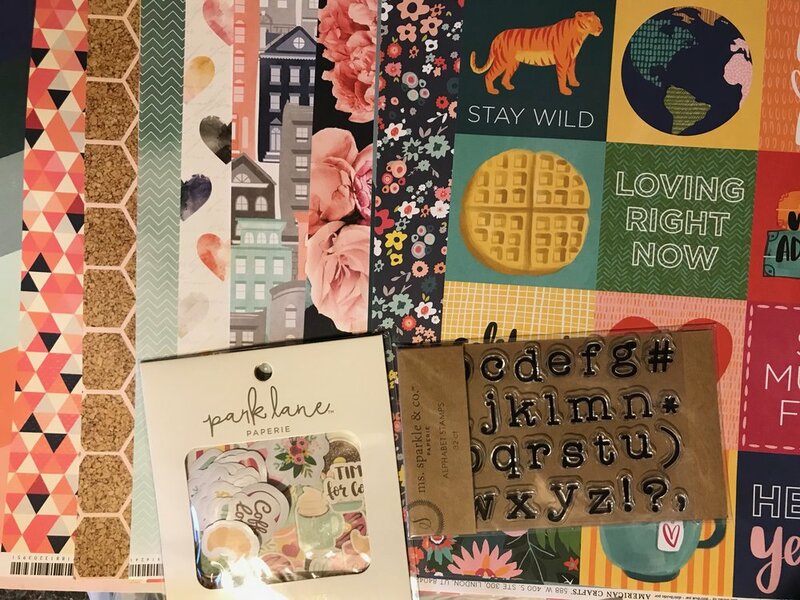 1) Botanical Butterfly Designer Series Paper (149622 Level 1 or $50 Item) — We get new butterfly stamps, punches, dies (not featured here but check them out), and even some patterned paper! I can’t contain my glee! This paper is just gorgeous and I really love that SU did a black and white side so we could create some lovely layered patterns! 2) Tea Time Framelits Dies (149697 Level 2 or $100 item) — These beauties coordinate with the Tea Together Stamp Set above. Plus, SU has informed us that this die set will be carrying over into the new Annual Catalog (June). But you can get them now with $100 in product! 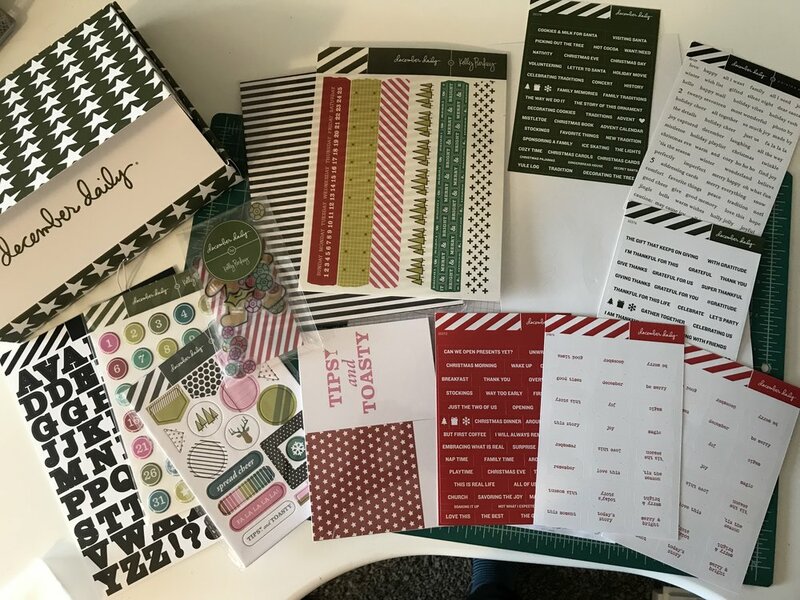 3) Grapefruit Grove and Lovely Lipstick Foil Sheets (149712 Level 1 or $50 Item) — I’m a sucker for anything shiny and these sheets do not disappoint! So there you have it! My top products from the new Occasions Catalog and SAB brochure. What will you be ordering? Before Christmas, I placed an order for the newest Mambi Happy Box, but alas, shipments were delayed. 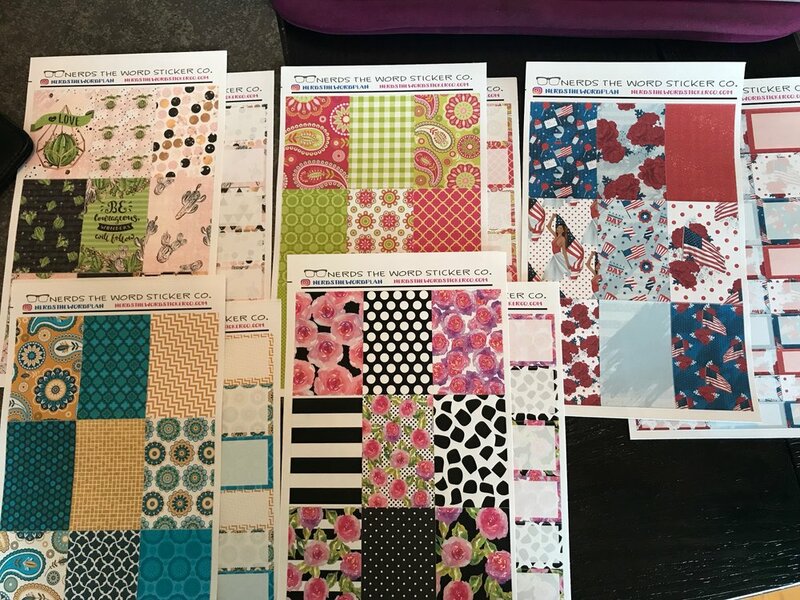 At the same time, I added these great goals sheets and color boxes to my order. Those were waiting for me when I got back from Indiana. I also took advantage of another $1 Wednesday at Fabulously Planned to get these cute coffee kit sheets and January colored boxes and movie marques. And finally my Happy Box arrived! Just check out all these beautiful goodies I got! 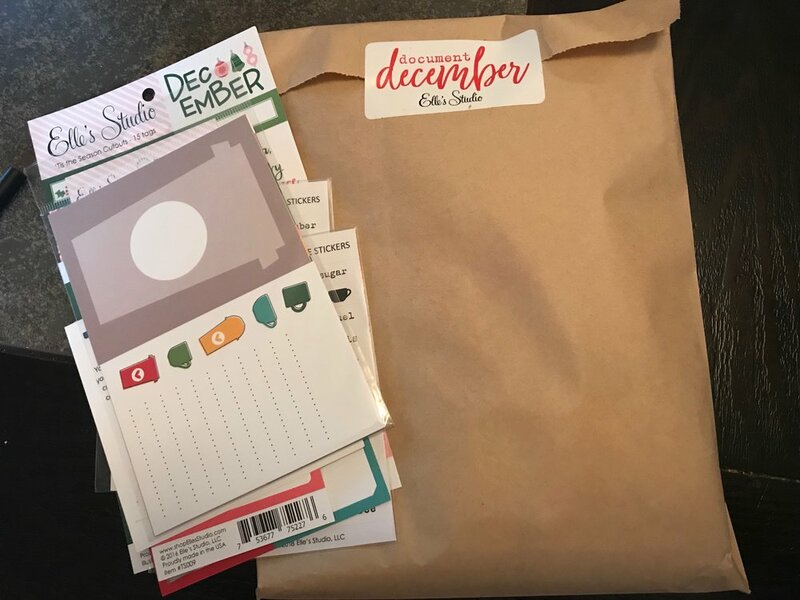 I can’t wait to use that new sticker book to decorate a few weeks in my planner and that cute mini disc bound notebook to hold my to-do lists!